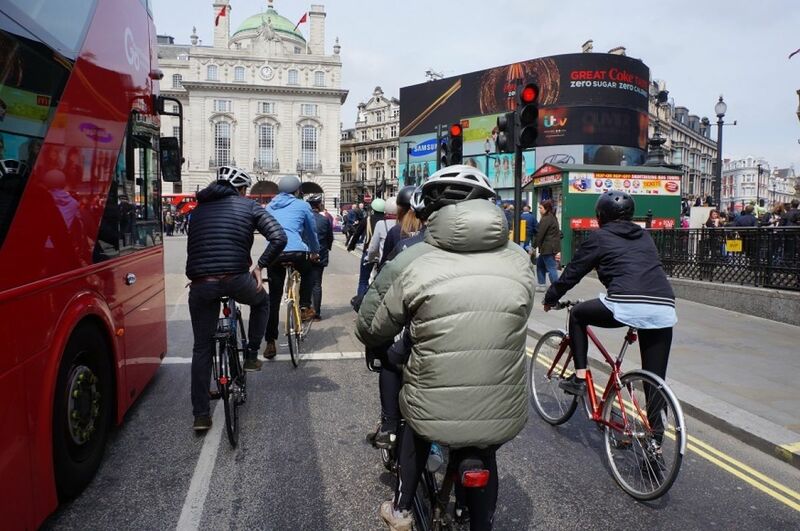 “Anything that gets more people cycling improves life for other users of the transport network too – even motorists," says a document launched last week by the Greater London Authority and the Mayor of London’s office. Human Streets, a legacy document profiling the growth of cycling in London in the last five years, points out that car ownership in London is low. It says the “debate about cycling is distorted by complaints from a loud, but small minority – who tend to believe, often quite sincerely, that 'everyone' drives. In fact, only 3 per cent of Londoners drive a car or van in central London every day, and only 7 per cent once a week or more. 71 per cent of Londoners never drive in central London." GLA is keen to point out that cycling in the capital is now what it calls “mass transport” and should not be neglected by the next Mayor. ”It is sometimes suggested that cycling is a marginal or fringe activity," states Human Streets. ”In London, this is no longer true. In zone 1, during the morning rush hour, 32 per cent of all vehicles on the roads are now bicycles. On some main roads, up to 70 per cent of vehicles are bicycles." According to TfL, motorists entering central London during the morning peak in 2000 outnumbered cyclists by more than 11 to 1. By 2014, the ratio was 1.7 to 1. "If these trends continue, the number of people commuting to central London by bike will overtake the number commuting by car in three years," believes TfL. In Herne Hill, south London, the closure of a road to motorists (it was still open for pedestrians and cyclists) caused fury. Businesses complained it would slash their trade. The Herne Hill Society now says it has been "crucial to the continuing regeneration of Herne Hill” and is “such a success that it now seems strange that it attracted so much controversy”. Part of this controversry is caused, says GLA and Boris’ office, by the "them and us" mentality between some motorists and cyclists. "Many think of cyclists as somehow a separate species, unconnected to the rest of the transport system. But of course, anything that gets more people cycling improves life for other users of the transport network too – even motorists, in the end," says Human Streets. And it’s this “in the end” bit that’s currently ruffling feathers in London because the building of the new Cycle Superhighways has led to short-term traffic congestion. London Mayor Boris Johnson says in the document: "Cycling in London has never been more popular. The number of bike journeys has risen by two-thirds since I became mayor. Above all, cycling in London has never been more normal. Eight per cent of black and minority ethnic Londoners are now frequent cyclists, the same proportion as white Londoners." He continued: "Yet though we must cater for the numbers of people cycling, there’s an even better reason why I hope my successor will carry on where I leave off. It’s that if more people cycle, everyone else benefits too, even if they have no intention of getting into the saddle. Everyone who gets on a bike is freeing up space for someone else on the bus, or the train, or indeed in a car. Everyone who cycles is improving not just their own health but other people’s health, because bikes do not cause pollution." He adds: “Our population is growing by 10,000 a month. To cope with all those new people who need to use the roads, we must make better use of the roads - by encouraging people on to forms of transport, such as bikes, which take up less space. Getting people out of cars is in fact the only way to keep London moving for essential business and commercial vehicles. Doing nothing with the roads would not return us to some never-existent ‘50s Elysium of free-flowing traffic. Doing nothing would mean that congestion gets worse than it is now. "Cities compete these days on quality of life. London can’t afford to stand still in that – our rivals won’t." TfL's "cycling Tsar" Andrew Gilligan also writes a foreword for Human Streets. He says: "Officially, the cycling programme is about cycling. In reality, it is about breathing." He adds: "It’s about pollution, about health, about noise, about the kind of city we want to live in. It is about making the best use of scarce space on the roads, about freeing space on public transport. Most of the people who will benefit from the cycling programme aren’t cyclists. "Much of the opposition to cycling schemes is based on a belief that motor traffic is like rainwater and the roads are the drains for it. If you narrow the pipe, these people say, it will flood. If you block one route, they say, the same amount of traffic will simply flow down the next easiest route. But that seldom or never actually happens in practice. Because traffic isn’t a force of nature' it’s a product of human choices. Our surveys tell us that huge numbers of Londoners will choose to cycle if they feel safe doing so. If we open up that choice, even more people will take it." Carlton Reid is the editor of BikeBiz.com and author of Roads Were Not Built For Cars. He drives a brand new Nissan Note (“it’s got a reversing video camera,” he enthuses), but not for short journeys.